iDancehallReggae.com::Caribbean Lifestyle Media::: BUZz: The Caribbean’s First Eco-Music Festival to be held in Jamaica This Summer. BUZz: The Caribbean’s First Eco-Music Festival to be held in Jamaica This Summer. July 2nd 2011, history will be made when Earthbound Jamaica in association with United Nations Environmental Programme (UNEP) and Environmental Foundation of Jamaica (EFJ) presents “Green 4 Life” Eco-Music Festival, the first of its kind in the Caribbean Region. The beautiful, breathtaking Rivfalls located in Magotty, St. Elizabeth will provide the ideal backdrop for this first Festival. ‘Our Mission is to raise awareness about Jamaica’s environment using audio and visuals aids. For patrons to see why we need to preserve Jamaica and it’s beauty; to discover our country and its important resources; introduce new products and methods for today's lifestyle, in a surrounding built by Nature and filled with Jamaican music and Healthy foods.’ remarked Yolande Rattray-Wright, the Festival’s Producer. “Green 4 Life” seeks to highlight quality products here in Jamaica, Healthy-eating habits, Natural Medicines, Jamaican Fashion and so much more. A Grand Farmers Market will also be organized to assist local area farmers with their cash crops. A brand new venue, RivFalls, for this trailblazing event houses natural waterfalls, 100% spring water stream and a large beautiful green landscape. Stone Love Movements will lead off the entertainment package for ‘Green 4 Life’ playing roots reggae all day. The Live show with some of Jamaica’s top entertainers such as Stevie Face, Jack Radics, Lady G, Professor Nuts, Admiral Tibet, Lovindeer, The Jays, G-Whizz with more to be added accompanied by a star-studded band led my Ewan Simpson. 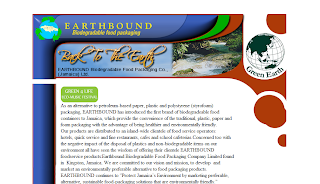 The team of Earthbound Jamaica, the first Jamaican company specializing in 100% biodegradable food containers and packaging and The Wright Agency having over 28 years of experience in the entertainment, show production, event planning and promotions at the international and local level are our to produce a world-class event for the entire family to participate in. Visit the website here.